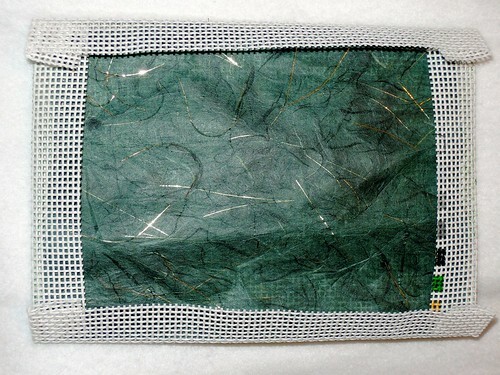 Here are the fibers I used for the background. image, a photo by Carmen CS on Flickr. 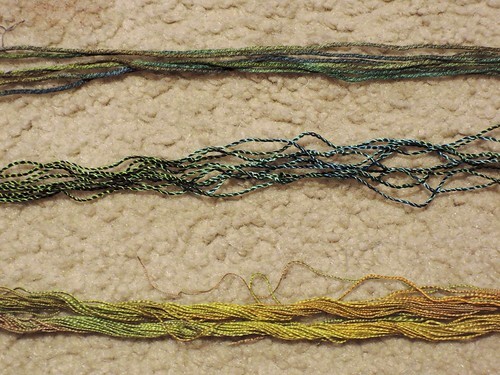 The top one is the heavy thread I used for the trees. Next is a loose spun thread used on the darker meadow areas. Finally, the lighter meadow areas were stitched using a silk with flames, which means tighter areas and looser areas. Laid down with long stitches, these fibers show off their irregularities to make a rich background that looks complicated while actually being fast and easy to stitch! Prayer: Father, thank You that our irregularities make us unique, beautiful, fitted for individual purposes in Your world. 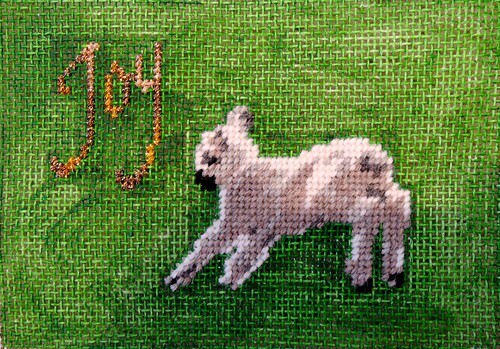 Rather than leaving the background openwork, I decided to do some fancy stitching with different fibers to make a scene for the leaping lamb. This was done freehand, using different variegated textured threads. 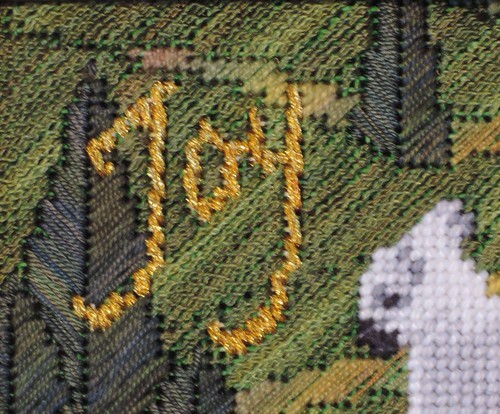 I stitch the trees first, then fill the landscape in around them and the lamb and Joy. Fun and quick, as the stitches are long. Prayer: Father, thank you for the beauty we each can bring just working in the background. I pray for those who work quietly to know that they do Your work. Recently our pastor and his wife left for an encouragement trip to missionaries in the Philippines sent by our church 20 years ago. 20 years in the field! Perhaps this is normal, but I didn’t grow up in the church and it seems extraordinary to me! He asked the church members to send cards of encouragement. 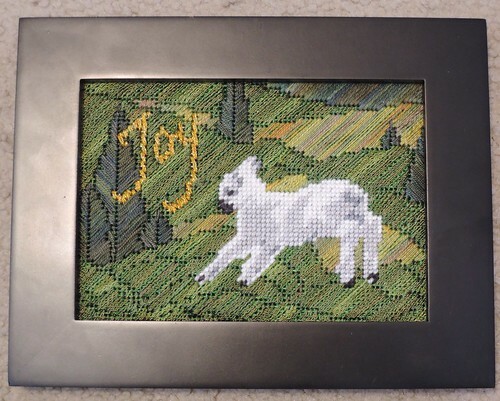 There was just enough time for me to stitch this piece for them. Missionary Joy, a photo by Carmen CS on Flickr. Prayer: Father, please bless this family which has devoted so much of their life to your service and service of your people. Bring them an ever closer walk, unexpected joys, long worked for successes, wisdom for their path. Finally, here is the completed, framed piece! Leap for Joy Complete, a photo by Carmen CS on Flickr. 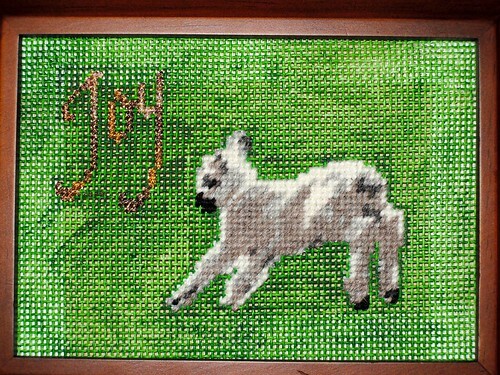 Prayer: Father, please bless the family this piece was made for, and bring joy and growing closeness to their walk with You! The answer is to insert an appropriate mask. Here I have chosen a piece of green handmade paper which includes metallic golden highlights. I cut it to size, and then insert it between the front of the canvas and the edges which have been folded to fit in the frame. Note that you DO NOT trim the canvas to the size of the frame, or the edges may unravel! Masking inserted, a photo by Carmen CS on Flickr. Prayer: Father, the love must extend even to the details! Help this family to find joy in the details of their lives. Joy without Masking, a photo by Carmen CS on Flickr. Prayer: Father, help us to do our work well and attend to all details to make a fitting offering for Your glory and a fitting gift for the people we serve. This canvas can be stitched in an afternoon. A few lovely hours of prayer and service, focussed on others rather than myself. What a blessing for me! I just hope it is equally blessing to the people I make the pieces for. 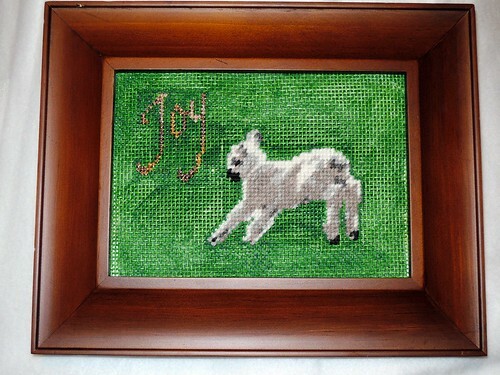 Leap for Joy Stitched, a photo by Carmen CS on Flickr. Prayer: Father, thank you that doing your work can bless others as well as blessing ourselves.